Mistletoe, shiny wrapping paper, freshly iced cookies, the occasional snow...there's not much I don't love about Christmas. Every year after Thanksgiving, I brave the rickety attic stairs and pull down boxes to deck the halls of the T home. It's become tradition for T to begrudgingly drag our fresh tree inside and divide his attention between watching ESPN and me battling strands of lights in an epic struggle to illuminate the front window of our home. Although I am wildly annoyed by T's amusement, I still look forward to decorating the tree and fighting over whether or not his hideous Big Bird Head Ornament (a childhood gift) deserves a place of honor at the front and center of the tree. I am quite sure it is now also tradition for our neighbors to watch me through the large window, balancing precariously on a metal folding chair, shouting in frustration as the fifth set of lights on top of the tree refuses to light up. I bet they sit and watch smugly with their cocoa and laugh at that crazy chick across the street. That's the funny thing about traditions...while they may be amusing or outlandish to others, they are something our own families look forward to as we welcome in the holiday season. Some of you have been kind enough to share the traditions you hold near and dear to your hearts at this month's Dishing It! party, and today I thought I'd share a few of my own. Spending time with family and friends is something we all look forward to at Christmastime. Even though it means some extra cleaning, T and I enjoy inviting both of our families over for a Christmas Eve dessert buffet. We attend church as a family, and then rush home to get the food out. Dessert is less work than dinner for 20, and now that children are in the picture, we've turned it into a potluck. Who couldn't resist hot chocolate and a cookie (or two or three) on Christmas Eve? We all have things to keep us busy at home in December. 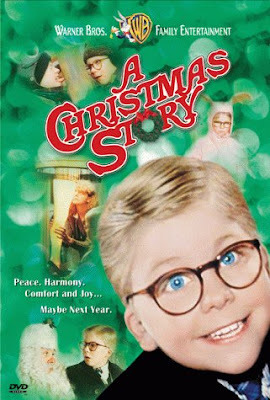 We crank the Christmas tunes all month long, and I always find a way to fit in a viewing of A Christmas Story, which is my favorite Christmas movie. It was a favorite of my dad's as well, and I have fond memories of watching it with my own family when I was growing up. T and I usually watch it together on Christmas Eve and I go to bed with a smile on my face, picturing Ralphie Parker and a Red Ryder with a "compass and a stock and this thing which tells time." I'd be lying if I said I don't get excited about opening gifts on the 25th. T likes the pressure of waiting until the last minute to shop for stocking stuffers, and he usually forces my sister to go out shopping with him so I don't end up with a stocking full of batteries or screw drivers or something hideous like that. My favorite part is sitting in the living room by the tree on Christmas morning, watching the girls' faces as they come through the door and see the gifts that "Santa" left under the tree. After opening stockings in the other room, they usually forget about a whole room of presents! In honor of God's ultimate Gift to us, His Son, we take some time each year to choose small gifts to fill a shoebox for Operation Christmas Child. I love that my girls take the time to think about the way children in other countries live and to get excited about blessing others. Remember that no matter how simple, traditions foster warm memories that your family will treasure for years to come. I hope you'll come join the party and share some of the things that makes Christmas special for your family. I love A Christmas Story! I love watching it on Christmas Eve while my hubby and I are wrapping presents...so glad TBS does that 24 hour marathon:) We did 3 boxes for Operation Christmas child, and my boys had a great time picking out stuff and making it fit into the boxes. Your dessert buffet looks so nice. Spending time with family definitely is the best Christmas tradition. You are lucky to have a lot of family in your area so you can easily get together. I like that you get a live tree. I miss getting one but the mess and yearly light trouble made me go faux. Now that your girls are older, each Christmas must get better and better as you watch their excitement! I love everything about Christmas too. Even the nonstop hustling and bustling around every.single.day. haha! I love A Christmas Story too. I now have my kids loving it. You'll shoot your eye out! That last pic of Natalie is too cute. We've done Operation Shoebox a lot in the past. It's so easy for kids to participate and help with that. You have wonderful traditions, Amanda! And you'll add to them as the girls get older. What fun lies ahead of you! Love that photo of Natalie on Christmas morning! She's so beautiful--a little copy of her mama! Operation Christmas Child is one of my favorite things to do! Love the Christmas Eve buffet idea too! What a sweet picture! I love it! Great traditions. I giggle thinking of you yelling at the lights in front of your window. So funny! Love your Christmas Eve buffet. What a great tradition. And the OCC box is the best, of course! Sweet traditions. I HATE my computer broke and I'm so rushed today. I HATE missing Dishing IT! We will Dish it again soon, I hope? I definitely want one of everything on that table up there. I love everything about Christmas!! The music, the movies...sights and sounds!! Wowzers! Makes me giddy! And to be surrounded by family and friends. Ahhh! Bliss! And it is all because a wee child was born this day and we call Him Jesus!! King of Kings and Lord of Lords!! Amen! !